The TallyGenicom 6820 line printer is the fastest TallyGenicom line printer. It prints up to 2,000 lines per minute. The quiet, enclosed cabinet printer improves reliability and reduces noise emission, making it ideal for office environments. 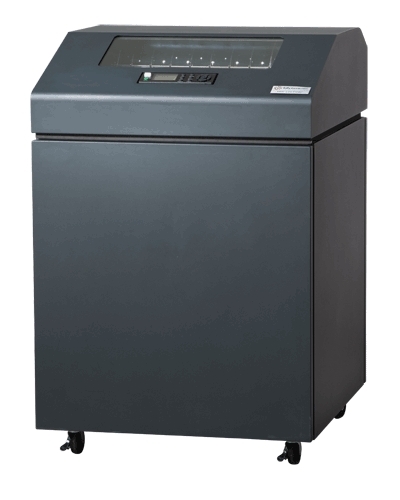 It is the quietest and most versatile choice in our mission-critical line matrix printer series. This industrial-strength printer is ideal for noise-adverse areas running large, unattended print applications. Its genius lies in its design. Adaptable Functionality. The TallyGenicom 6820 line printer adapts to almost any supply-chain or back-office environment. PowerPrint™ delivers improved print clarity and print darkness on multi-part forms by increasing impact energy. PowerPrint is a standard feature on TallyGenicom 6820 printers. Manageable Savings. The TallyGenicom 6820 line printer is a smart purchase.